Western Sahara is on the Atlantic coast of north-west Africa, between Morocco to the north and Mauritania to the south and east and Algeria to the north-east. The area of Western Sahara is 266,000 sq km of which 180,000 sq km (68%) is occupied by Morocco and 86,000 sq km (32%) is controlled by SADR, the Saharawi Arab Democratic Republic. In the eighties Morocco divided the territory with a 1,800 km wall or berm made of sand, stone, landmines and barbed wire. The wall is watched over by radars, artillery, and air force, and is protected by 160,000 armed soldiers. Another 920 km of walls have been built inside the occupied area. Western Sahara is rich in mineral resources, including phosphate mineral rock which Australia imports contrary to international law. Western Sahara has one of the best fishing grounds in the world. Currently its off-shore oil resources are being explored. Morocco invaded Western Sahara in 1975 when Spain abandoned its former colony. Mauritania seized part of the land, but soon made peace with the Polisario Front, the Saharawi people’s political organisation, which continued the fight against Morocco. 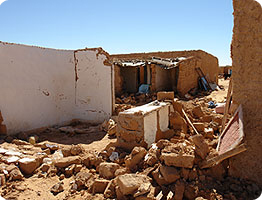 Many Saharawis fled the tanks and aerial bombardments of napalm and cluster bombs of the Moroccan invaders and set up refugee camps near Tindouf in south-west Algeria where more than 165,000 of them now live supported by the UN Food Program and other humanitarian aid. Those who remained in their homeland have constantly faced arrest, imprisonment, death and “disappearance” at the hands of Moroccan occupying forces. Their escape is blocked by a 2,400km wall dividing Western Sahara into the coastal zone occupied by Morocco and the interior part held by the Polisario Front. In 1975 the International Court of Justice held that Western Sahara was not terra nullius at the time of its colonisation by Spain and that neither Morocco nor Mauritania had sovereignty over it at that time. The war between Morocco and the Polisario continued until an UN-African Union brokered a ceasefire in 1991. The UN has arrangements in place for a referendum of self-determination of the Saharawi people but Morocco refused to allow the referendum to be held. While life is scarcely viable in the harsh Hamada desert where the refugees live, as there are no means for self sufficiency, the Saharawis living in occupied Western Sahara suffer the terrible oppression already noted. MINURSO was established to organise a referendum for self-determination of the Saharawi people in 1992 as part of peace process between Morocco and Polisario. By 1996 the peace process was in stalemate. In 1997, James Baker (George H. Bush’s Secretary of State) became a UN envoy and drew up a new plan for the referendum, the Framework agreement on the Status of Western Sahara. Morocco refused to co-operate. 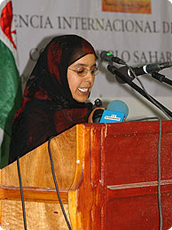 In 2003 Baker made a new plan, known as Baker Plan II – Peace plan for self-determination of the people of Western Sahara. This was accepted by the UN and the Saharawi Arab Democratic Republic (SADR). Morocco still refuses to allow UN sponsored referendum to take place. Since May 2005, there has been an increase in this oppression. Peaceful demonstrations have been brutally put down. Many Saharawis have been arrested and imprisoned. Some have been tortured and some have “disappeared”. Women and children have been assaulted in their own homes and their property stolen by Moroccan police and soldiers. Outsiders, including parliamentarians from the European Union, Spain and Norway have been refused entry to Western Sahara. So have human rights bodies from Norway and elsewhere. The Saharawis have their own democratically elected government, the Saharawi Arab Democratic Republic (SADR), with men and women ministers and parliamentarians. Its officials run the camps. SADR is recognised as the legitimate government of Western Sahara by at least 80 countries, most recently by the Republic of South Africa and Kenya. It is a member of the African Union. In May 2005 in preparation for the full recovery of all of the Western Sahara territory SADR announced the commencement of a licensing initiative to enable international oil and gas companies to participate in the exploration of its offshore territory. This licensing initiative is open to all competent and qualified companies and has been arranged in accordance with the UN legal opinion regarding commercial activities in Western Sahara. SADR believes that development of its significant natural resources will play an important part in developing a self-reliant, democratic and progressive nation in Western Sahara. The present situation cannot continue. The oppression of the Saharawis in occupied Western Sahara must stop. The refugees in the camps must feel safe to return to their own country after the referendum to be ruled by a government that they elect directly. The UN, the African Union, the European Union and nations individually must act to ensure that Morocco no longer precludes the referendum on self-determination for the Saharawi people from taking place. The Saharawi people must be allowed to determine their own future through a free and fair UN sponsored referendum.